Over the years, Salukis have carried a variety of names. Early Egyptian cave drawings indicate that the breed is among the oldest. Known as the ‘Royal Dog of Egypt’, many owners choose ancient Egyptian names for their Saluki. Names of Pharaohs and Queens like Ramses, Cleopatra, and Khafra are particularly popular. While some owners turn to the Rosetta Stone, others choose a name that fits the breed’s physical characteristics. 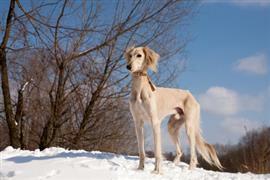 Once thought to be the fastest breed, the Saluki is known to wear many speed related names. Atomic and Berzerk are common names that highlight the Saluki’s swiftness. Other speed related names can be taken from famous Olympic athletes and sports figures. Some of our pages will contain a subcategory. A subcategory is a slightly more specific grouping than the main topic of the page. For a subcategory, we will include a separated table of names and corresponding descriptions. An example of a subcategory of Red Dog Names would be 'Dog Names Inspired by Red Wines'. If you have any subcategory ideas for the Saluki Names page, we would love to hear them. Use the form below to submit your ideas.